Georgia Totto O’Keeffe was an American artist who mostly painted large flowers presenting them as if seen through a magnifying lens and was part of the American Modernism Movement. She was born on November 15, 1887, in a farmhouse near Sun Prairie, Wisconsin as the second of seven children. At age ten she had already known that she would be an artist. Her and her sister took classes from Sara Mann, who was a local watercolorist. O’Keeffe attended the Art Students League in New York City, where she won a scholarship to attend the League’s outdoor summer school. She won the scholarship for her oil painting Dead Rabbit with Copper Pot. In 1908 O’Keeffe was working as a commercial artist in Chicago after relinquishing her career as an artist. Four years later she was introduced to the ideas of Arthur Wesley Dow in the University of Virginia, where she was motivated to paint again. At this time women didn’t have access to art training in America’s colleges and universities. Yet this is where she learned about expressing herself through her paintings. Dow believed that someone could use line, color, and shading harmoniously to express themselves. From 1916 to 1918 O’Keeffe used the Palo Duro Canyon as a subject in her works while teaching in West Texas A&M University in Canyon. Georgia O’Keeffe found her own style of painting around the mid-1920s. She added repetitive colors, forms, and themes in her works during the 1930s. “She liked to stress visual edges that have metaphysical implications: between night and day, earth and sky, life and death. She was not afraid of the large, symbolic reverberation; her bones often seem strangely alive, the flowers of the desert” (Georgia). 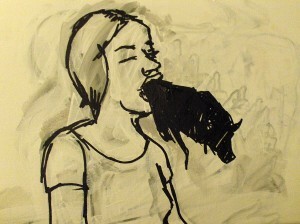 She usually painted flowers and bones which let her violate certain boundaries. Some of her most famous paintings are: Cow’s Skull: Red, White, and Blue and Cow’s Skull with Calico Roses. 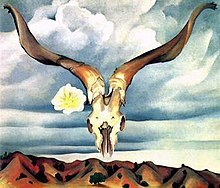 O’Keeffe began painting bones because of the majestic landscape of New Mexico. 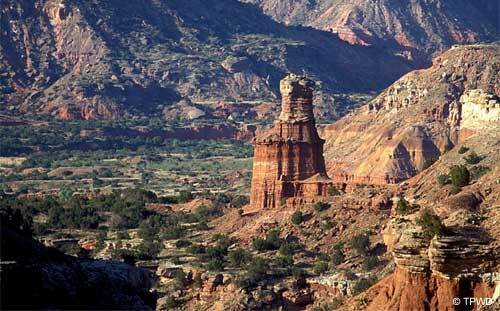 The desert bones helped her imagination but what brought everything together was scenery that was before her. “With its unusual geological formations, vivid colors, clarity of light, and exotic vegetation, that held her attention for more than four decades. Often she painted the rocks, cliffs, and mountains in dramatic close-up, just as she had done with her flower subjects” (O’Keeffe). Chadwick, Whitney. Women, Art, and Society. New York, NY: Thames and Hudson, 1990. Print. "Georgia O'Keeffe Biography." Georgia O'Keeffe Biography. N.p., n.d. Web. 19 Nov. 2012. <http://www.lkwdpl.org/wihohio/okee-geo.htm>. "Georgia O'Keeffe." Gegorgia O'Keeffe Paintings, Biography, and Quotes. N.p., n.d. Web. 19 Nov. 2012. <http://www.georgiaokeeffe.net/>. "Heilbrunn Timeline of Art History." Georgia O'Keeffe (1887Â1986). N.p., n.d. Web. 19 Nov. 2012. <http://www.metmuseum.org/toah/hd/geok/hd_geok.htm>. The Guerrilla Girls' Bedside Companion to the History of Western Art. New York: Penguin, 1998. Print. Post 4 ANGELS AND TOMBOYS!!! Faith Ringgold: 20th C. Woman Artist!